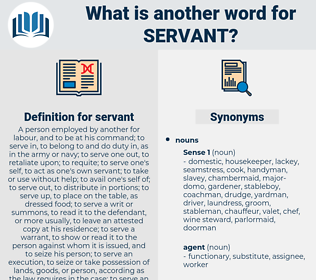 What is another word for servant? A person employed by another for labour, and to be at his command; to serve in, to belong to and do duty in, as in the army or navy; to serve one out, to retaliate upon; to requite; to serve one's self, to act as one's own servant; to take or use without help; to avail one's self of; to serve out, to distribute in portions; to serve up, to place on the table, as dressed food; to serve a writ or summons, to read it to the defendant, or more usually, to leave an attested copy at his residence; to serve a warrant, to show or read it to the person against whom it is issued, and to seize his person; to serve an execution, to seize or take possession of lands, goods, or person, according as the law requires in the case; to serve an office, to discharge the duties of a public office; time- server, one who regulates his actions by the requirements of the times instead of by duty; one who meanly complies; a servant of servants, one debased to the lowest condition of servitude; your humble servant, your obedient servant, & c., conventional phrases of civility at the close of a letter, coming immediately before the signature. agent, server, minion, staffer, servo, clerk, wench, assistant, follower, domesticus, minister. functionary, slave, waitress, handyman, messenger, worker, vassal, helper, bureaucrat, disciple. An old servant here in the house, too, knows him." Follow the servant in and don't give them a moment to think. scorpaenidae, sharp-pointed, scrivened, scorpion weed, scorpaenid, scorpaenoid, scorpaenoidea, scorpionweed, sorbent, saraband, scorpionida, sharpened, sea serpent, sarpanitu, serpent. house servant, domestic, servant girl, seneschal, flunky, factotum, body servant, menial, flunkey, lackey, Familiar, serving girl, manservant, major-domo, domestic help, scullion, cabin boy.